Britain is not publishing any economic news today and GBPUSD will be more influenced by economic data in the US such as Consumer Sentiment Index from Michigan University and Retail Sales for April. Furthermore the oil price affects this pair as well. 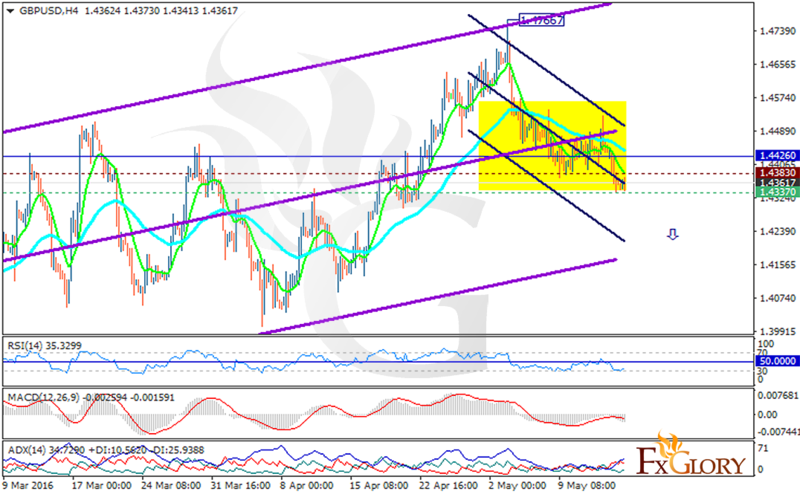 The support rests at 1.43370 with resistance at 1.43830 which both lines are below the monthly pivot point at 1.44260. The pair is falling down the descendant channel. All indicators confirm the sell signal, the MACD is in negative territory, the RSI is below the 50 level and the ADX is showing stronger sell opportunity than buy. The EMA of 10 is staying below the EMA of 50 suggesting the price fall over the last recent days. The support level breakthrough will smooth the way for further decline to 1.4240.